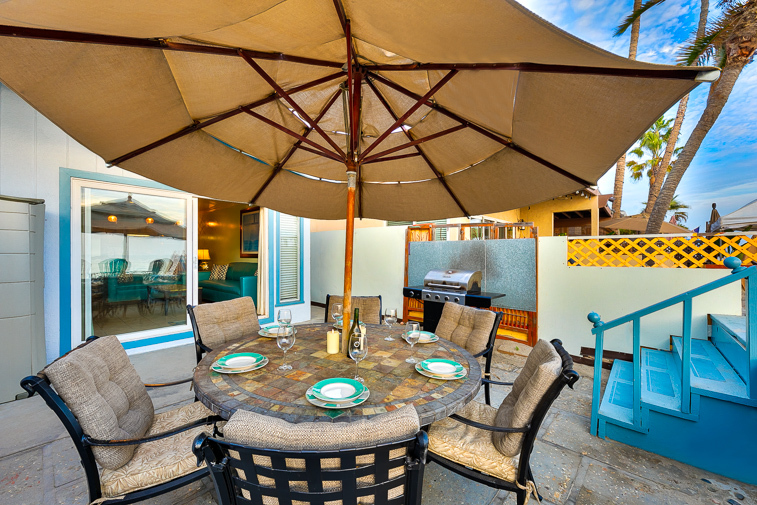 Al fresco dining becomes an easy treat with a barbecue and the kitchen inside - just steps away. Color sunsets are just one of the many things you'll love to take in - often dolphins play just off shore too! Please note, the condition of the beach is subject to weather and tidal conditions as well as the time of year. Sweeping ocean views from this seaside home on a semi-private stretch of beach on Dana Point. Welcome! Please note, the condition of the beach is subject to weather and tidal conditions as well as the time of year. 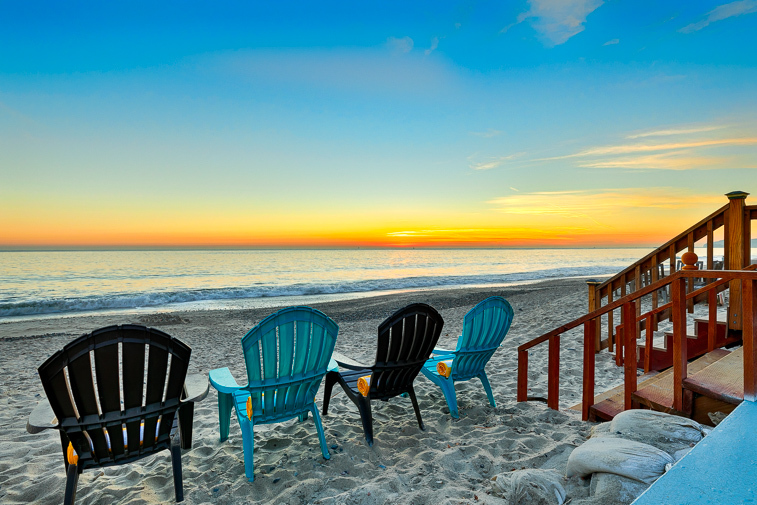 Welcome to the beach - in all its color, fun and grandeur. Please note, the condition of the beach is subject to weather and tidal conditions as well as the time of year. 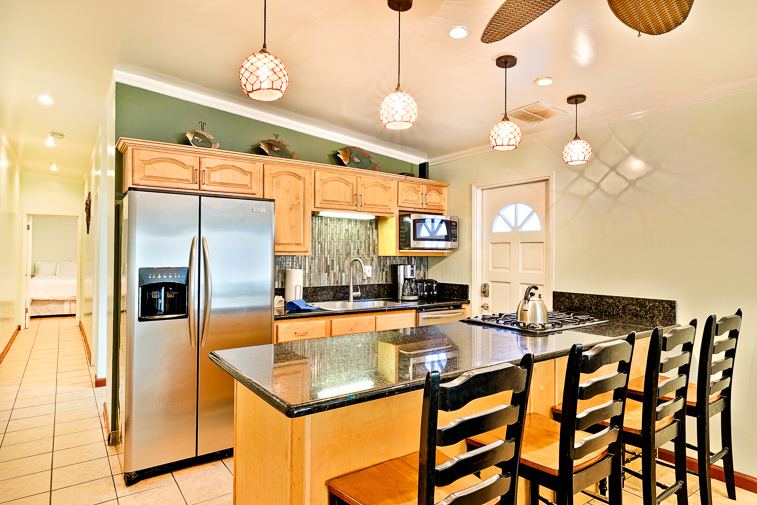 Modern kitchen with breakfast bar and high-top stools - making it easy for everyone to eat together inside too. 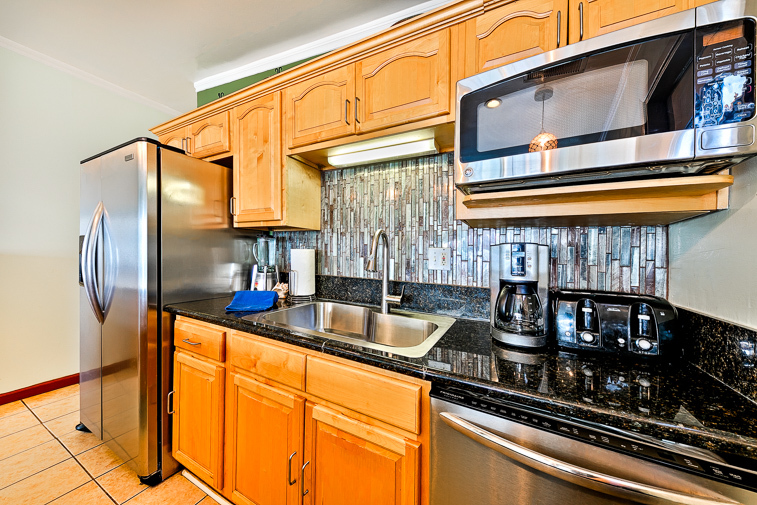 Stainless steel appliances and granite countertops - this kitchen has everything you need to create meals and snacks for your crew. 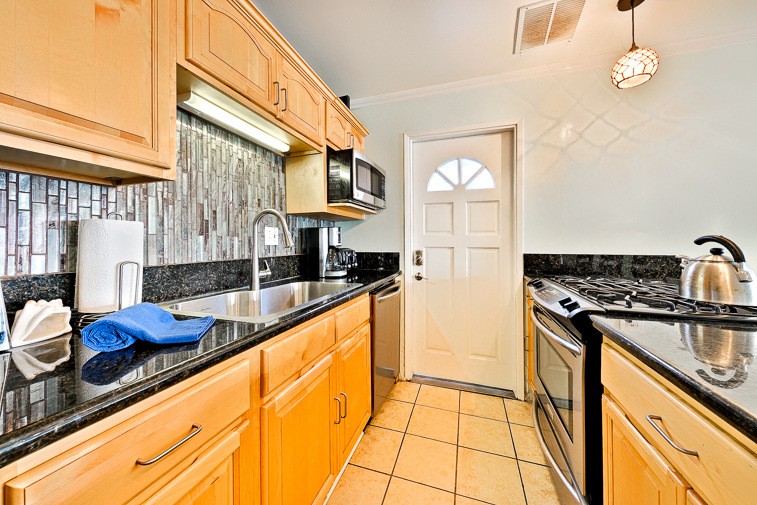 Beautifully remodeled kitchen will make you feel right at home. 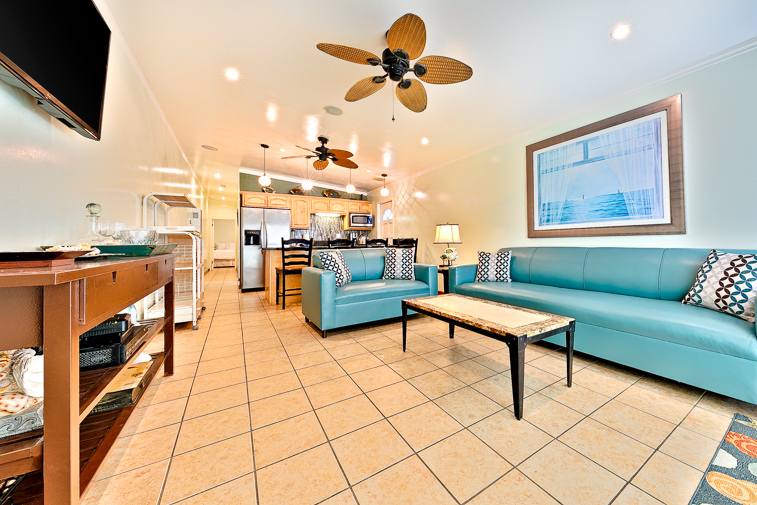 Beach chic family room with access to well-furnished outdoor patio. 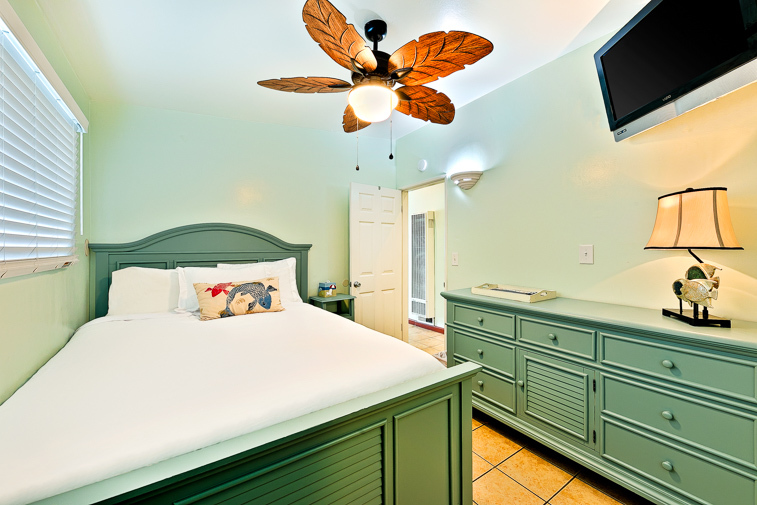 Flat screen TV for your enjoyment and a ceiling fan too to keep you comfortable any time of day or night. 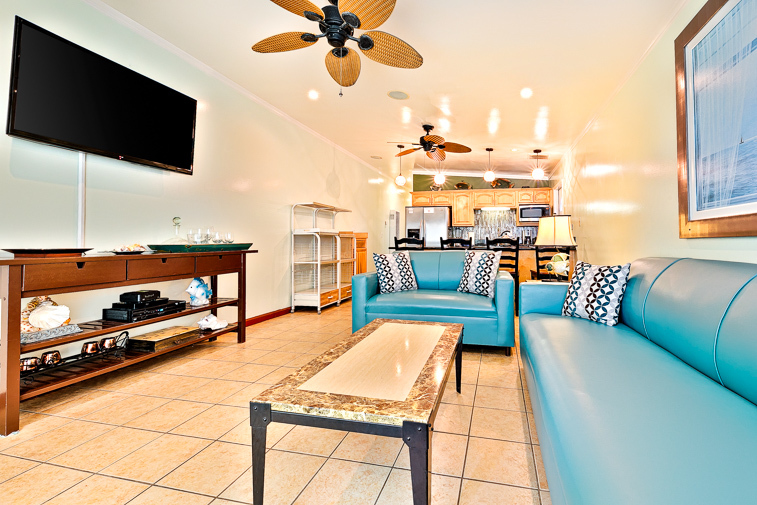 Lots of comfortable seating for you to stretch out on and relax or recharge. 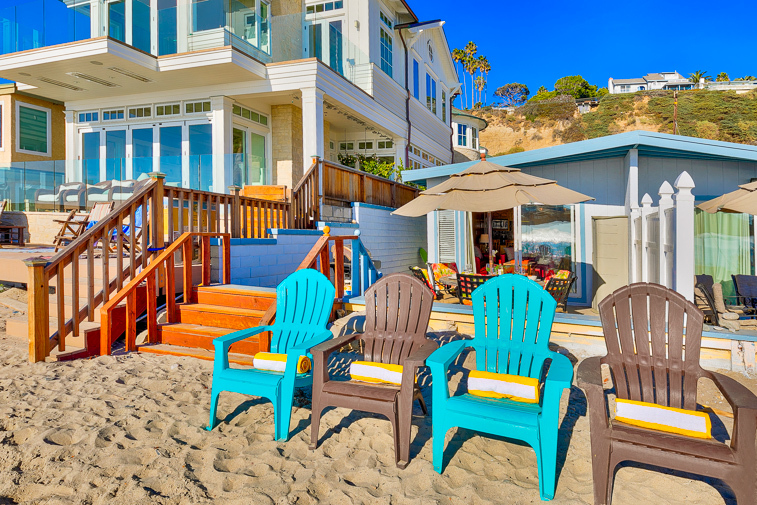 This 1 story home is to the right behind the colorful lounge chairs. Please note, the condition of the beach is subject to weather and tidal conditions as well as the time of year. Softly colored queen master bedroom with an ensuite bath. 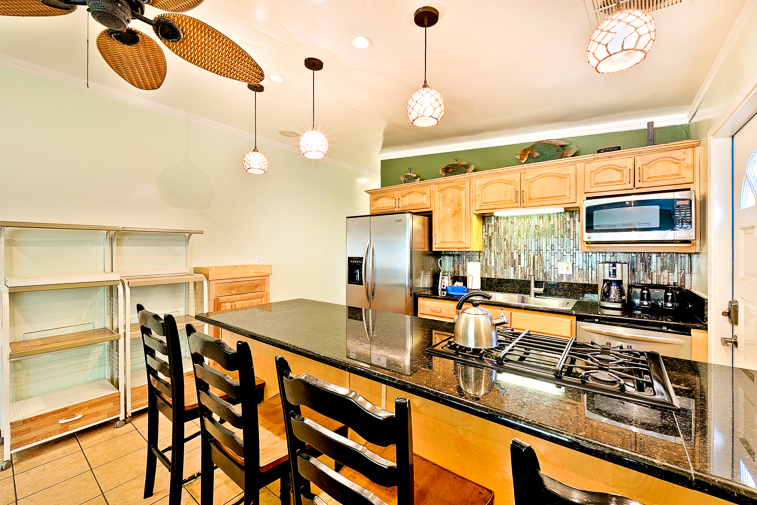 Queen master with ceiling fan, lots of storage and a flat screen TV too. Master queen bedroom from another point of view. 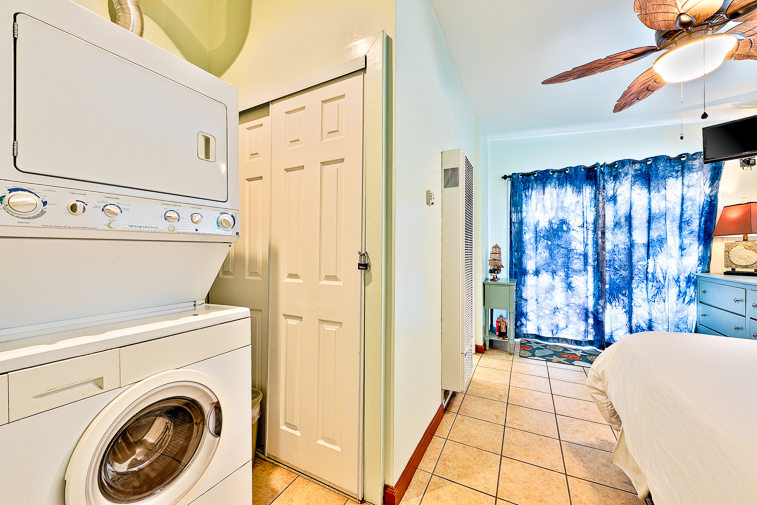 Washer and dryer for your convenience too. 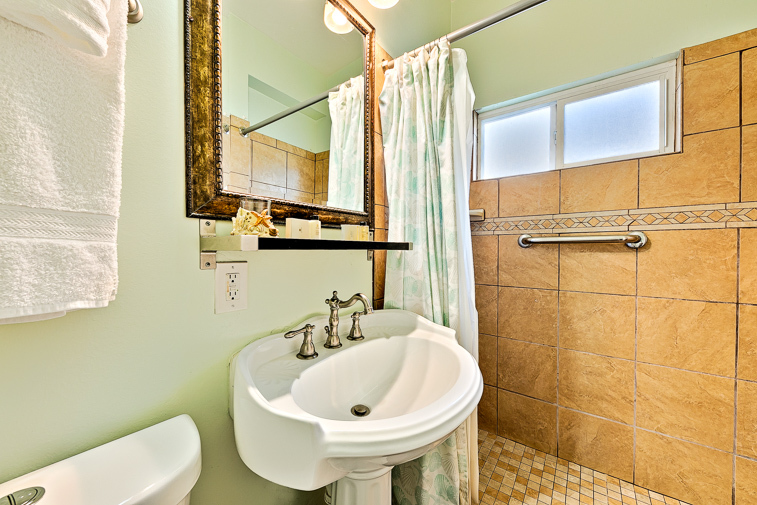 Master ensuite bath with large walk-in shower. 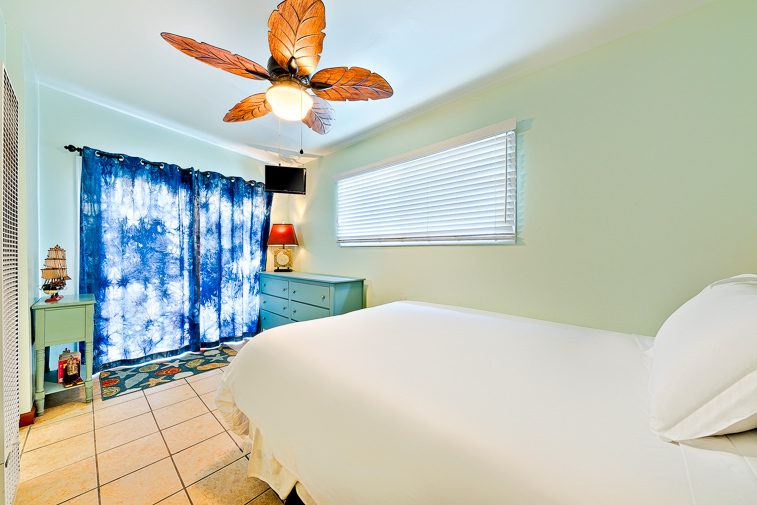 2nd queen bedroom - also with a ceiling fan and a flat screen TV. 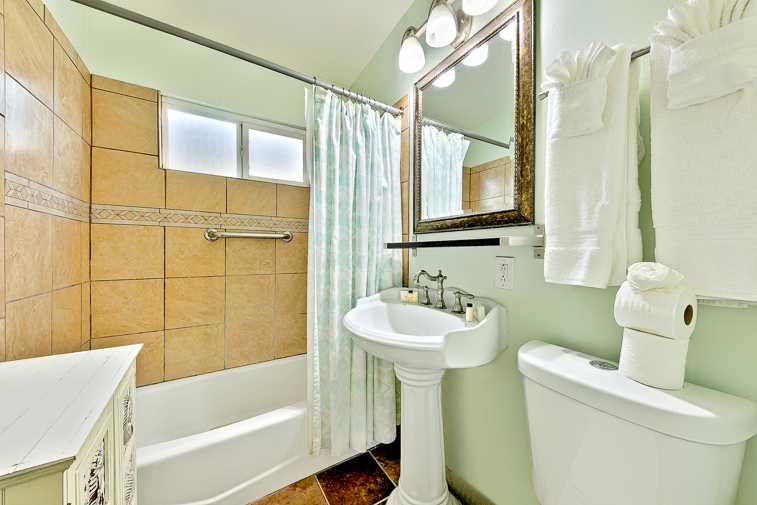 2nd bath with shower/tub combination. 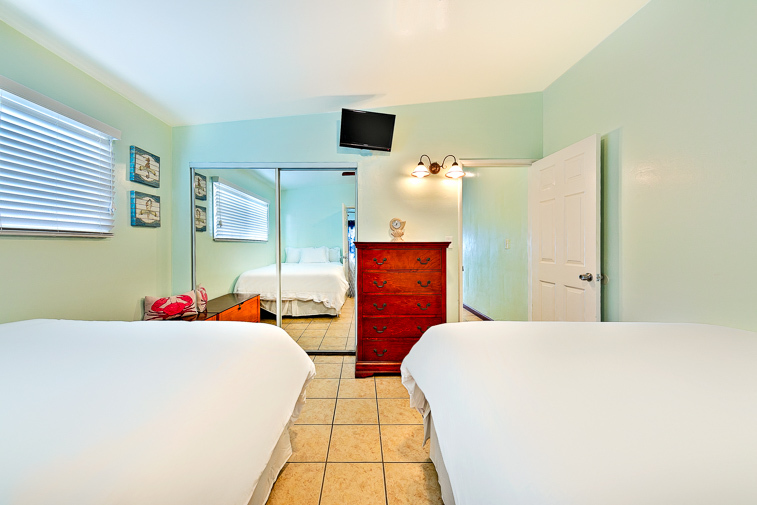 3rd bedroom with 2 queen beds so this home sleeps 8 in beds, 10 if an air mattress is rented. 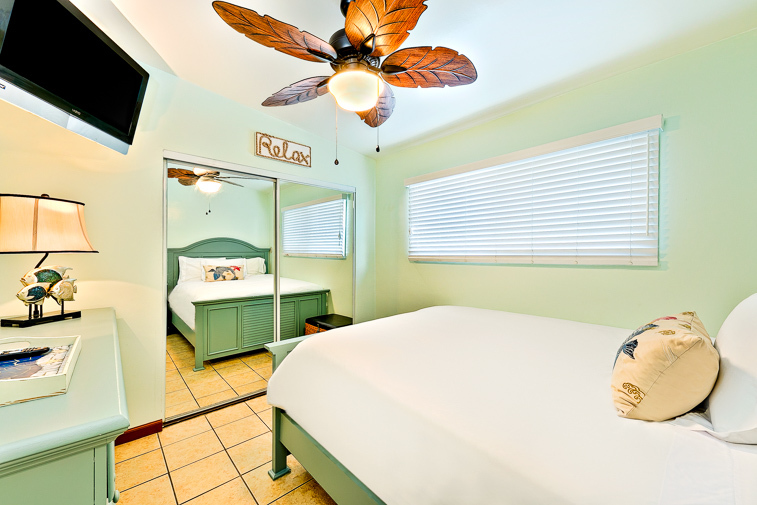 This bedroom also has a flat screen and a ceiling fan for your enjoyment and comfort. Please note, the condition of the beach is subject to weather and tidal conditions as well as the time of year. Please note, the condition of the beach is subject to weather and tidal conditions as well as the time of year. Large barbecue makes meal making easy after your day's adventures. 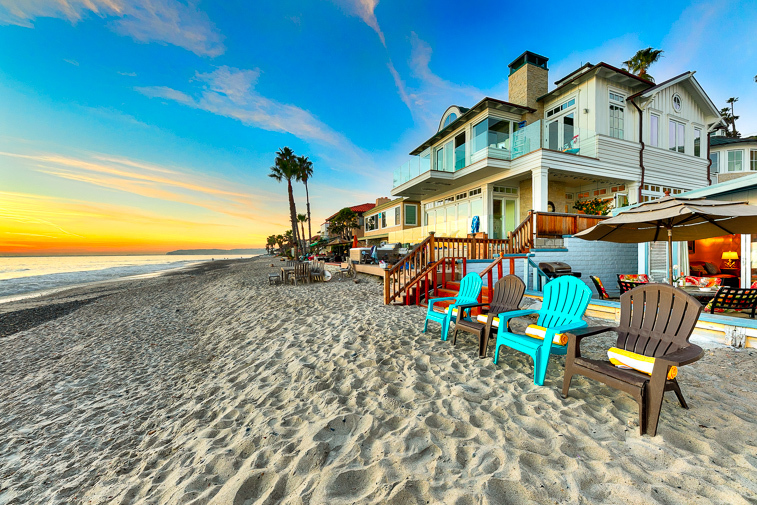 This home, on what is affectionately called California’s Rivera, is in the exclusive gate guarded community of Beach Road in Capistrano Beach. It is a perfect place to experience the romance and the energy of the ocean without crowds – a level of privacy and seclusion not commonly associated with beachfront property. 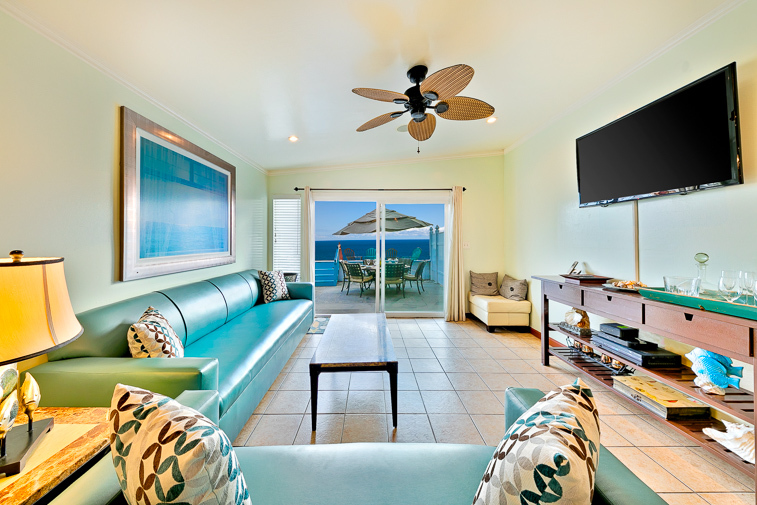 Relax on the well-furnished deck or step off the deck and dig your toes into the sand as you find your perfect comfortable lounge chair. Swim, surf, or paddleboard in the ocean, take a walk, bicycle on an ocean path, or run down the beach, kayak, go boating, or play golf at a nearby course. 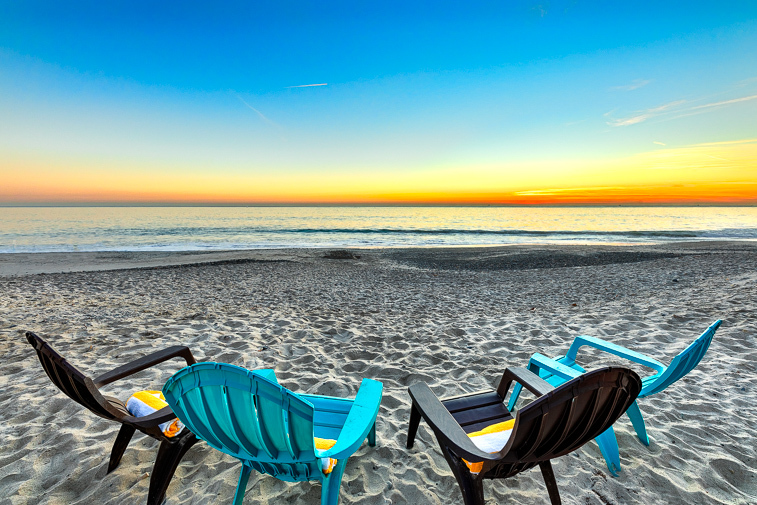 Have a barbecue family dinner on the deck and watch the sunset and starlit skies, take a bike ride to Dana Point or even read a good book while watching birds dive in the water and dolphins play. This 1000 sq.ft. 3-bedroom 2-bath home, in a side-by-side duplex, has an open relaxed feeling starting with the ocean view great room with slider access to the well-furnished front deck and cluster seating where enjoy the large flat screen TV. A modern has all you need to satisfy your culinary desires including a breakfast bar with high-top stools - positioned next to the dining area for 8 – so it is easy for everyone to eat together. There is a queen master bedroom, and a 2nd bedroom with a queen bed. 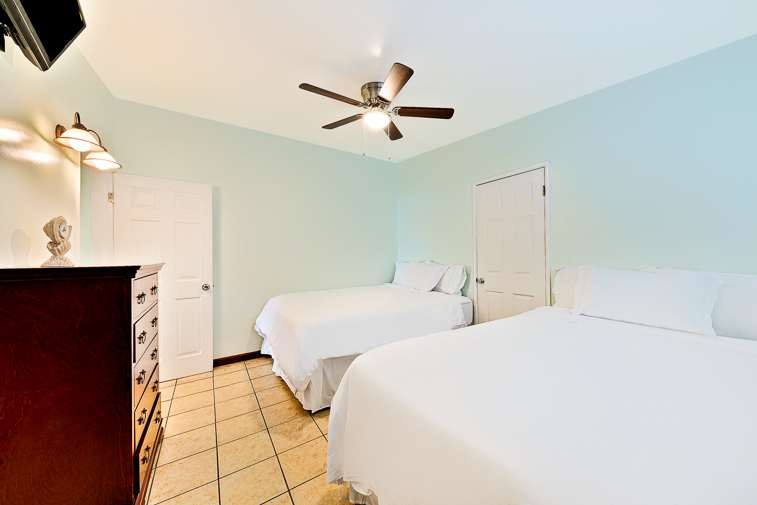 The 3rd bedroom has 2 queen beds, so this home comfortably sleeps 8 in beds; if you request an air mattress 10 can sleep comfortably. 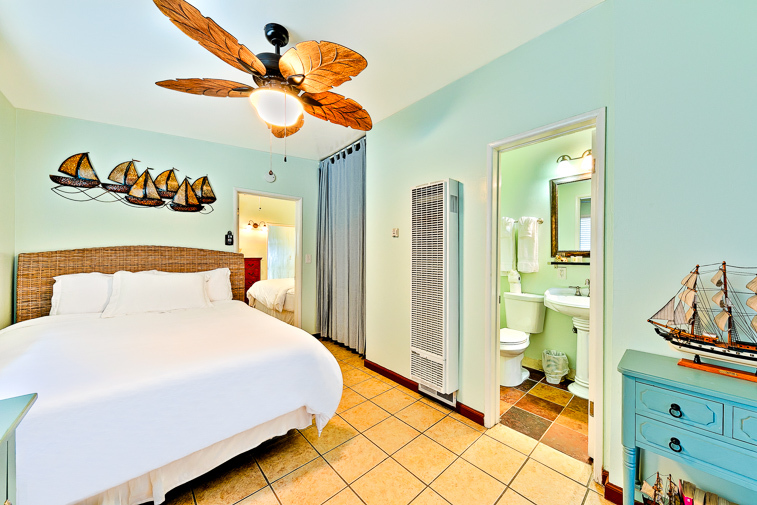 There are 2 bathrooms - one with a large walk-in shower and the other with a separate tub and shower. 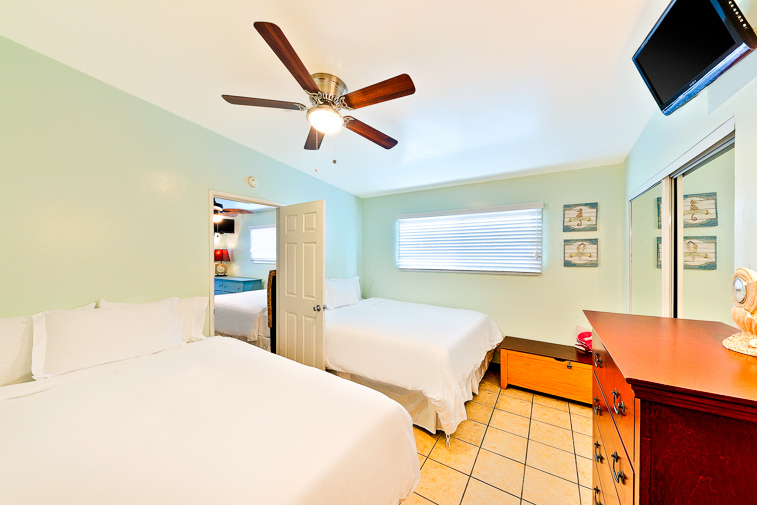 Additional amenities include a washer and dryer, WIFI and cable, an outdoor shower, and a DVD player. There is also parking for 2 cars in the driveway. 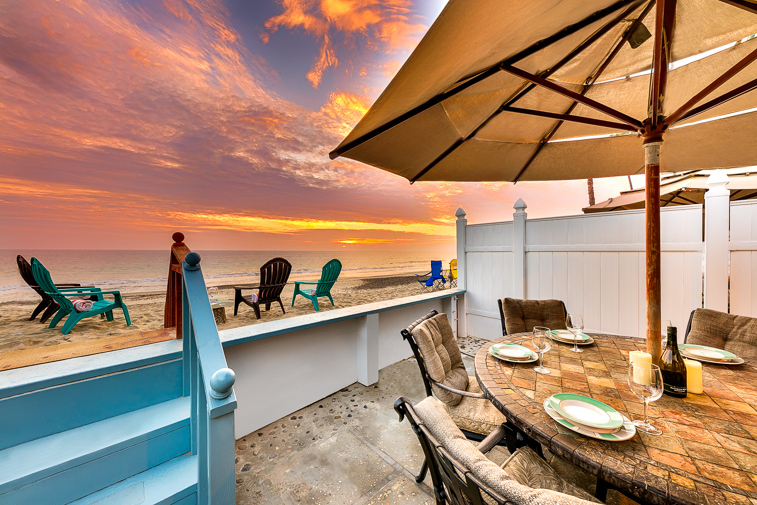 Come enjoy this seaside retreat where there is no boardwalk or street to cross; you literally step off your private patio and your toes touch the sand. You'll never hear the "I'm bored. What's there to do?" There's always something to do at the beach! Whether you're swimming, surfing, body boarding, building a sand castle, or just relaxing in the sun, you'll really feel like you are on vacation. You very likely will also create some amazing memories of your stay on this little slice of paradise and you may even decide to return someday. 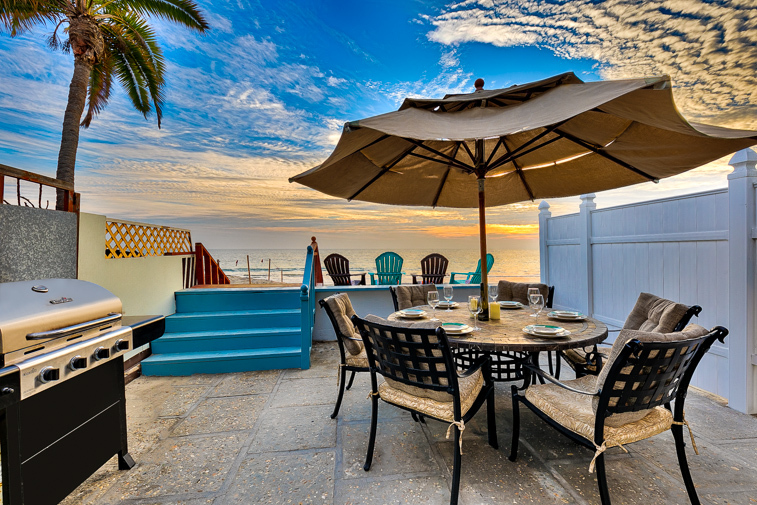 The large well-furnished oceanfront deck is great for enjoying sweeping ocean views, sunsets, starlit skies, and lots of ocean wildlife - birds, whales, dolphins too - making it an exquisite seaside experience. 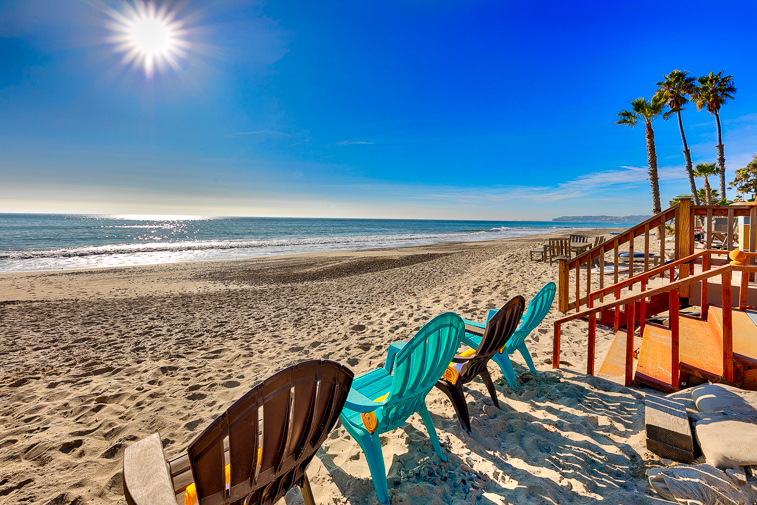 It is just a short ride to great restaurants in Dana Point and San Clemente as it is between these two seaside communities where you will find lots of restaurants and shopping. It is 30 minutes from the airport and 2 minutes to the train station. This property is NOT considered a Luxury property & is a comfortable beach front location priced accordingly. 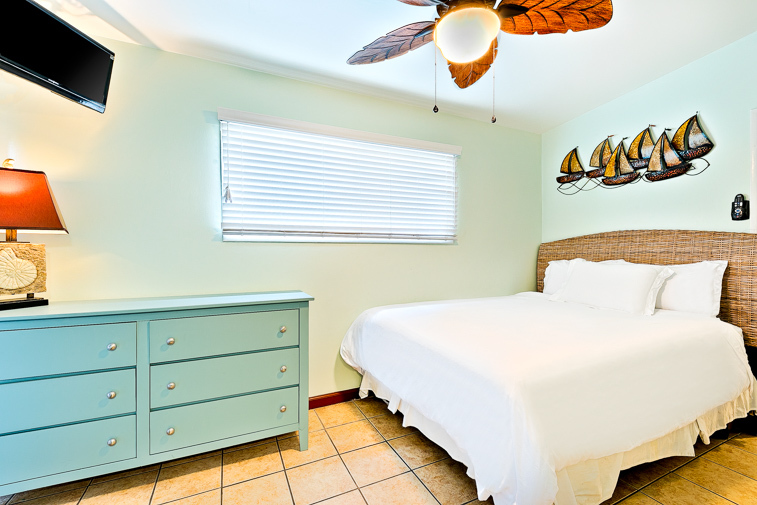 Beach Front properties face harsh conditions daily from the salt air and sand, please make sure you are comfortable with this before booking. Would stay here again! Perfect location, and great home. Very pleased to have had the opportunity to stay Friday to Monday during the music festival taking place. 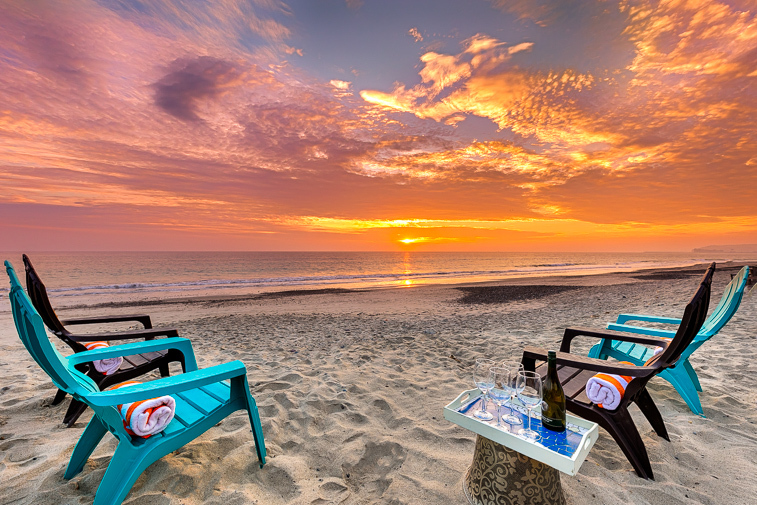 Proximity to the venue and beach access made it an ideal place to relax. Very good vacation, comfortable home, and perfect location. As advertised, this home was comfortable, with everything we needed. Nothing too fancy, but very clean and a homey feel for our stay. We will for sure return. It was great staying here to escape the heat. Location is prime and it allows for everyone to enjoy what they would like to do. I recommend this vacation rental to anyone who is looking. Great location right on the beach.